It is a principle in Anglo-Saxon law that destruction of evidence is prima facie indication of guilt. In Brief History, we saw the Time, May 3, 1993 photograph of the destruction of evidence at the Mt. Carmel Center. But even after the event the perpetrators needed a cover for further alteration of the crime scene. The Texas Rangers provided that cover. After all, the Texas Rangers had been accomplices from the beginning, when they surrounded Mt. Carmel before the raid (Treasury Report, pg. 79). On April 20 the FBI pretended to turn over the crime scene to the Texas Rangers, and the Texas Rangers pretended to accept the responsibility (Washington Post, April 21, 1993). Let us visit the principle of plausible denial once again: "The principle of plausible denial is simply if an operation or action is later disclosed, for example, as an action by the United States government, the government can plausibly deny it, deny any involvement or connection with the action." -- E. Howard Hunt, ex-CIA operative, quoted by Mark Lane in Plausible Denial. 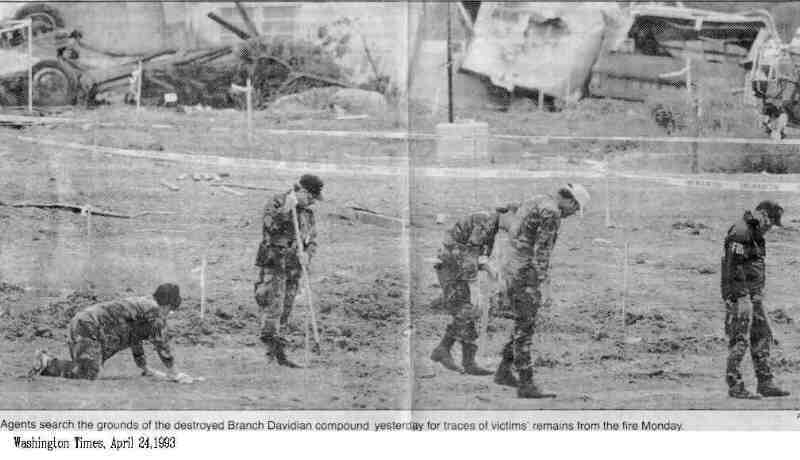 A newspaper photo (Washington Times, April 24, 1993) shows FBI agents searching the grounds for Davidian remains on April 23. No Texas Ranger supervisor is apparent in the photo or mentioned in the caption. Two hundred fifty "law officers" --many of whom were FBI agents -- stomping over the crime scene each day could arguably destroy a crime scene more efficiently than a herd of elephants. Not only were the Rangers deputized to the federal government and put in charge of the crime scene that they were not able to control, but the Rangers' work force was stuffed with FBI and other officers to gather the evidence. Now who was truly in charge? Then, on April 31, "authorities bulldozed the concrete bunker that was the compound's last standing remnant." (Dallas Morning News, May 1, 1993). This action destroyed the site in which the bodies were found--within two weeks of the alleged date of the deaths. "Just a shell game with the evidence--it seemingly vanishes into State hands--but when traced, it turns out to have been in federal hands all along," wrote Hardy. And the Rangers were, temporarily, federal agents.